Wouldn’t it be great if there was a one-stop-shop for Edmonton blogs? Where you could see a list of all the blogs and maybe even see all of the latest posts too? A couple weeks ago I launched the latest release of ShareEdmonton. With the new version you can browse local blogs, see an always-updated collection of new blog posts, and you can search more than 10,000 posts written by local bloggers. While my tagging of local blogs at delicious didn’t last long, my desire for a directory of Edmonton blogs never diminished. Over the years I collected local blogs and subscribed to them in Google Reader. That worked fairly well for me, but it didn’t help anyone else. A couple of years ago the idea of a directory came up again, and Reg, myself, and few others started looking at the problem. That project eventually fizzled, but I think it helped the Edmonton Journal launch its community blogs page, an idea championed by Karen Unland. While that page was a step in the right direction, it included a very limited number of blogs and was often broken (the latest update seems to have fixed the issues with broken or incorrect links). There was a lot of false starts along the way, and far more challenges to overcome than I would have anticipated, but I’m very happy with the new release of ShareEdmonton. Is it a perfect, 100% complete, one-stop-shop for Edmonton blogs? Of course not. But it will help you keep up-to-date with a large number of Edmonton bloggers, and with your help it’ll get even better over time. For the initial release I wanted to make it easy to see the latest blog posts, and to browse recently updated blogs. Most blogs are updated relatively infrequently, and I didn’t want you to have to sift through those just to see what’s new. That’s a big part of the reason why there’s an emphasis placed on how recent something is in the UI. As a user, I want a “home page” for all the blog-related functionality, so that I can remember a single URL (shareedmonton.ca/blogs). As a user, I want to see the most recently updated blogs, with a title and photo (if one exists) for each blog. As a user, I want to see the most recently updated blogs by tag or category (such as food). As a user, I want to see the most recent blog posts, with a title, description, and photo (if one exists) for each post. As a user, I want to see the most recent blog posts for a specific blog (such as mine). As a user, I want to see the most recent blog posts for a specific blog tag or category (such as food). This is any post from a blog that has been categorized as a “food” blog. So if Sharon wrote a post about politics, it would show up here. As a user, I want to see the most recent blog posts for a specific tag or category (such as food). This is any post tagged by the blogger as a “food” post. So if I wrote a post about food and tagged it appropriately, it would show up here. As a user, I want to search all blog posts (for a query such as food). As a user, I want to see all blog posts by day for the last week, with a headline and source for each. As a user, I want to add a new blog to ShareEdmonton. I come up with new user stories all the time, and I welcome any feedback and/or suggestions that you might have! I followed that post back in 2007 with a list of blog posts talking about Edmonton. My aggregation & curation was fairly ad hoc back then, but now I write my Edmonton Notes every Sunday and Media Monday Edmonton every Monday. I try to include blog posts in those, but it definitely takes effort to keep on top of what everyone has written. I keep track of things I find during the week, and I do a quick scan at the end of week to find what I missed. Others post similar entries: Sharon does Food Notes, Karen does her Edmonton New Media Roundup, The Unknown Studio does the Edmonton Blog Watch, etc. These are all really useful and people love them, but they do take work. There’s a big difference between aggregation (gathering and perhaps indexing) and curation (sorting, categorizing, analyzing, presenting). When the bloggers I mentioned above write their list posts, they’re doing both activities. My hope is that with ShareEdmonton’s new blog functionality they can focus more on the curation part, which is where they really add value. I think “show me all the latest posts from Edmonton bloggers” is a task for software, and “tell me which are important and why” is primarily a task for people. But you need the former before you can do the latter. As expected, most blogs are based on WordPress. It’ll be interesting to see if this changes over time! 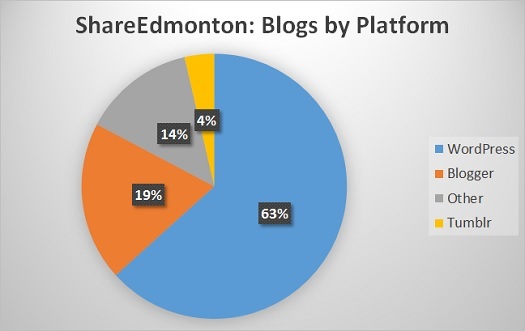 There are nearly 150 blogs currently being aggregated and indexed at ShareEdmonton, but I know that’s just the tip of the iceberg. I’ll continue adding blogs myself, but you can help by submitting your own blog or someone else’s here.